Welcome to Canadian Regius. 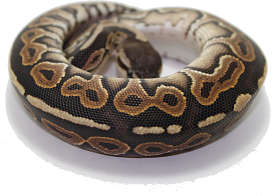 I am a small time Breeder/Hobbyist specializing in Ball Pythons (Python Regius). I believe in Quality over Quantity and therefore strive to offer the best! I am slowly building a collection that I believe represents these species to their fullest potential. I hope you find the perfect animal(s) for you! Feel free to have a look around. If you have any questions, comments or suggestions, don't hesitate to contact me. Check back often as I am always updating and evolving as the seasons progress.. Please Note: Website currently under construction and content is not up to date. For up to date information on breeding, clutches, availability, etc please visit our facebook page >> www.facebook.com/canadianregius. Thank you! Added some of what I have available for this year! Check it out! I have more, so feel free to contact me to inquire or check out my Facebook page for more up-to-date content. 6/8 Clutches have hatched so far this year and just starting next season already! Lots going on! I cut back on a few animals this year to focus on some key projects and will be updating the collection page shortly with some new stuff as well. Let me know if you have any suggestions!! Until next time.